As with The Goonies, the films of John Hughes, and Bruce Willis’ singing career (we assume), nostalgia for Robert Zemeckis’ 1985 blockbuster Back To The Future runs deep. Rare is the person who saw the film as a child and doesn’t evince some warm glow of recognition upon the mention of its name. Turns out, these rose-tinted memories aren’t merely shared by the audience for the movie—the actors feel much the same. 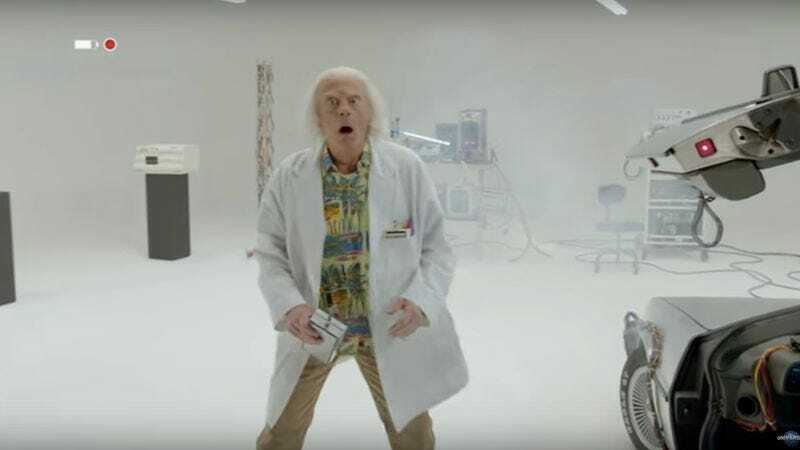 And since lightning always strikes twice (or four times, depending on how you feel about the sequels), actor Christopher Lloyd has once more stepped into the oversize sneakers of Doc Brown, for a new short film called Doc Brown Saves The World. According to the BBC, the new film was made as a special feature for the 30th anniversary re-issue of the Back To The Future trilogy. It’s set to be released on October 21, 2015—also known as the end date in the DeLorean at the conclusion of the original film, a nightmarish time when Crispin Glover has been replaced by a guy wearing prosthetics to make him resemble Glover. It’s unclear what the plot of the film is, but Universal has released a short teaser, which you can see below. And while Lloyd looks noticeably older, we’re guessing that’s explained in the film, possibly by having Doc Brown forced to continually travel back and forth between eras, forever righting minute slip-ups in the space-time continuum, doomed to fix one mistake only to trigger anew yet another tiny infraction. It just goes on that way, his “saving the world” a hopeless and eternal task, trapping him in a time prison of his own making, a Sisyphean punishment for having dared alter time in the first place. Should be a fun little flick.